Learn how to set up and use the free Radio.co Broadcaster software for broadcasting to your station. Our new desktop software lets you and your DJs broadcast live from your computer or laptop. It’s easy to set up, you can play music on any application such as Spotify or iTunes and you can use a USB microphone to talk over the music. To get started, download the broadcaster from this link, and then follow the steps to install it on your Windows 10 computer. Then, when you open the program you’ll see the login screen. 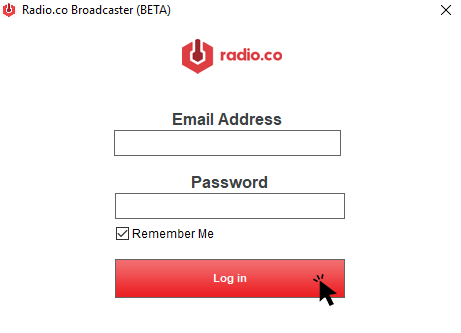 Enter your Radio.co login details, and when you’ve logged in successfully you’ll see this screen. Here, you can choose from any stations that you have access to, to broadcast. When you’ve selected the station, click the red button to get ready to broadcast. At the top, you can see a box showing you the time until your Live Event starts. This will also show you how long you have left when the event begins. 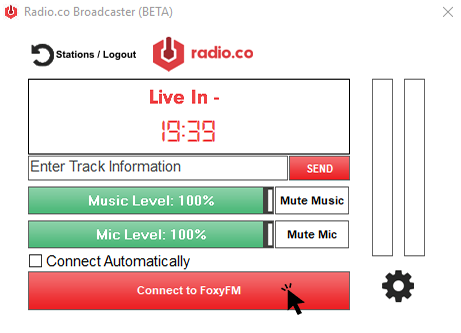 Note: If you’re the station owner and have Live Anytime enabled, then this will simply show Live Anytime Enabled, and you will be able to connect straight away. Moving down, you can see a space to enter some track information. In order to send track information to Radio.co, you can enter the track name here and click Send. Next, we can see two volume sliders - these will adjust the volume for both inputs that you can have. You can also mute each input. Then, there’s the big red button to go live. If the event has started, click this and you’ll connect to your station straight away. You also have the option here to connect automatically when the event starts so you don’t need to worry about connecting yourself. 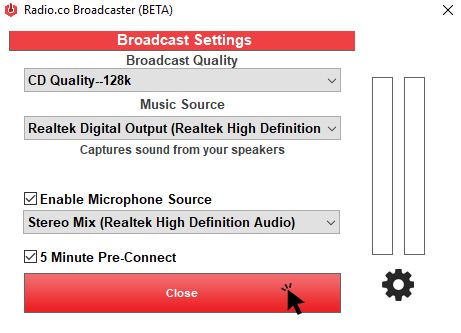 Starting from the top you can see the option to select your broadcast quality. Next, there’s the option to choose your Music Source. 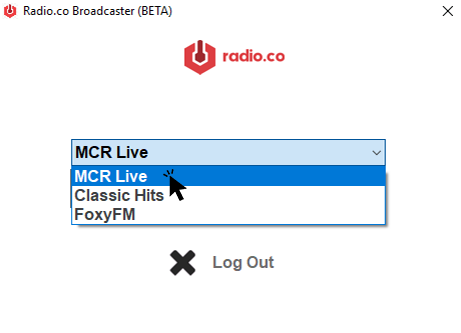 The Radio.co Broadcaster can handle two inputs at the same time, so you can choose the first one here. Another thing the Broadcaster lets you do is grab the audio you can hear from your speakers directly, without needing to setup Stereo Mix or a loop back through a mixer. You can do this by selecting the “Speakers” option. You’ll now see that the text underneath changes to “Captures sound from your speakers”. To enable the second input, such as a microphone so you can speak over your music, tick the box next to “Enable Microphone Source”. Then, select your microphone from the dropdown menu. The last option we have is to enable the 5 minute pre-connect. The Broadcaster allows you to connect to your station up to 5 minutes before the broadcast starts to make sure the connection is working. You won’t go live at this point, but you’ll be connected and ready to take over as soon as the clock on the main screen hits 0, and the countdown begins. If you don’t want to use the additional microphone ability within the app, then you can just plug in your mixer and then control your levels in the real world and disable the microphone input. The broadcaster will then work by just taking the audio from your mixer. The Radio.co Broadcaster is BETA software. This means that there may be some bugs which we’ll need to look into. We’re also looking for feature suggestions if you have any to improve the finished product. If you have any feedback, notice anything odd or need any assistance using the software, please contact us at help@radio.co and we’ll be happy to help. Runtime error 50003 - This error is related to some packages that Windows 7, 8 and 8.1 come with. These packages are out of date and so the Radio.co Broadcaster isn't able to use them. In order to fix this issue, you need to run Windows Update to ensure your computer has the latest updates installed. This should fix the issue. Acquiring Schedule message stuck on - This has been fixed in an update to the Broadcaster. Please download the update by clicking the "Download for Windows" button at the top of this guide. Please enter login details error, despite information being correct - This has been fixed in an update to the Broadcaster. Please download the update by clicking the "Download for Windows" button at the top of this guide.